My e-mail inbox is out of control. I’m using the new Priority Inbox at Gmail but it is still stuffed full of old newsletters, mailing list digests and of course the non-spam spam (that would be the ‘today only!! Sale!! !’ announcements from any website you have ever purchased from*). I have been ruthless in my deletion of messages I know I won’t ever read. I’m also unsubscribing to a number of regular senders which often results in unsubscribe-confirmation emails. Aagh! In my purging, I started to delete the email from Cookbooker, a website for posting cookbook recipe reviews. I signed up there at some point but never actually used the site. At the time, my focus was primarily ad-hoc cooking or using web-based recipes. Now I have about one-third of my cookbooks out of boxes, on a shelf, ready to be used and reviewed. But rather than start using those books and their recipes, I decided to take the Fall challenge by writing reviews for the recipes in the spotlight book, High Flavor, Low Labor. I don’t own this book but fortunately, the website provides you with three sample recipes to get you started. All three sounded pretty good to me and since Chris had been out of town for a week and would be leaving again in a week for another five days, I didn’t want to buy a fridge full of food that wouldn’t get eaten. 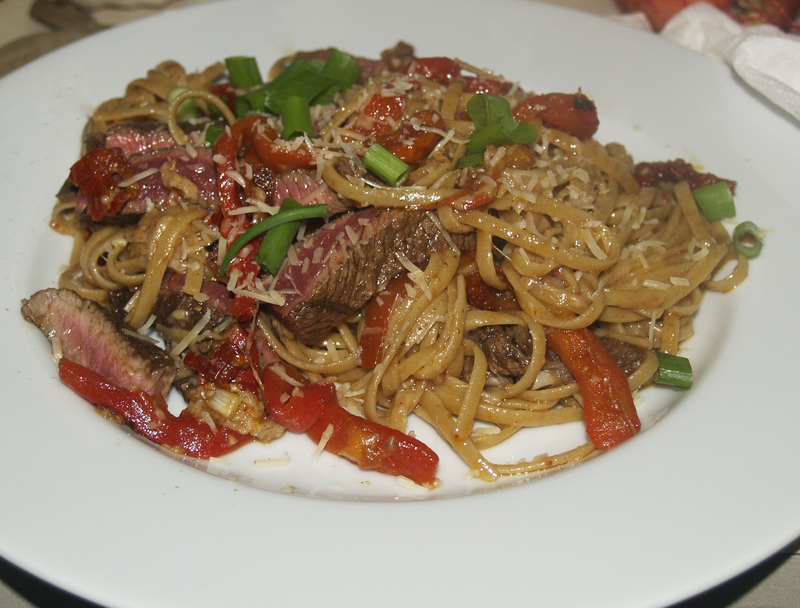 I decided to start with the sirloin and pasta because I either had a number of the ingredients on hand or knew that if I opened a jar of, for example, sun-dried tomatoes but didn’t use it all, I would be able to find another purpose easily enough. The sample recipe, Chili Balsamic Marinated Sirloin with Fettucine & Sun-dried Tomatoes is the third one provided, when you follow the link. I think you could figure that out, though. Note, firstly, that my blog post title is linguine, not fettucine. For reasons I can’t explain, the only brand of fettucine at the most convenient grocery store (a Kroger) is the cheapest name brand. I did not want. They also had the fresh, refrigerated stuff but I didn’t need that much. Also, I think I like the smaller size of linguine better. I bought a whole-wheat version and was quite happy with the outcome. I am not, historically, a buyer of steak so finding the right cut and the right size proved more work than I initially anticipated. I believe that my final choice was pretty close to the the recipe’s intentions although I couldn’t tell you what is was called, sirloin something**. I didn’t slice it in to strips before marinating/cooking because I was being lazy. And the trip to the store to buy the ingredients cut in to my time for cooking them (primarily because sun-dried tomatoes are in two places and I had to walk around a lot to find the right ones). But mostly because I am lazy. Other than halving the amount of meat and reducing the amount of pasta for serving two instead of four, I followed the ingredient proportions. Next time, I will either not be lazy and slice the meat so it can absorb more marinade or add more shiracha since I thought it needed heat. I also added a bit of the marinade to the tomatoes and peppers which was not called for but I liked it. For food safety reasons, you will need to cook this a bit more than “warm through”. The seasoning profile for this came out very well. Again, I would have liked a little more heat but you could definitely tell the shiracha was there. I salted the pasta water exactly right, apparently, because the linguine had a nice nutty wheat flavor but didn’t taste like salt. We both liked this and it really did only take 30 minutes. Garnished with a bit of green tops from our wee little onions in the garden. *On the drive home from a party Saturday night, we discussed diagramming sentences (honestly, no alcohol involved). I very distinctly remember not learning how to do this in junior high. I think my English teacher spent one day on the uselessness of the exercise and on we moved. Fast forward to AP English in my senior year of high school where the formidable Ms. Moore was crusading against all sorts of grammar violations including writing ‘alot’ instead of ‘a lot’, avoiding redundancy, again and not ending a sentence with a preposition. This last one is a struggle for me as I balance using academic language and structure with not sounding like a stilted buffon. I was trying to explain the problem to Chris by example except I couldn’t think of a single suitable sentence! Since he reads this blog, the sentence up there with the asterisk is just for him as is the reworded example to be ‘correct’ located in this paragraph. (Note: I was pleased to see that Grammar Girl says this ‘rule’ is really a myth and I shouldn’t worry so much about it). **I could have bought pre-sliced sirloin, apparently for stir-fry recipes except the premium on the per pound price was too high and the packages were only one serving each. My review at Cookbooker is here. I have also made the pesto chicken dish and plan to make the tomato-bacon jam tonight. If this third recipe is a success, I’ll probably buy the book even though I don’t really need another cookbook. I should probably get rid of some that I don’t use now but its a hard thing, much easier to say than do. We are back from vacation and I have tons to write about. I suffered mightily during our time in Canada- no internets? no twitter? no phone calls that don’t cost 79 cents a minute? I wish I had thought about what roaming in Canada would mean with a smartphone but I did not. THEN, we get to Waitsfield and I remembered what I forgot from last year. The Mad River Valley is not real big on cell phones, particularly Verizon phones. Someone told us last year that you could get coverage from one carrier but I don’t remember who. It was not Verizon. So, we had no cell service (and internet/twitter/etc) for 3 more days. There were so many times I wanted to send something on the fly and could not. I might have a problem. After a bit though, I decided to be easy and enjoy the distance from technology. This part of Vermont (probably like most of Vermont) is very green, very local-centric and organic. It seems only fitting that I detach from the world and focus on the right here, right now. After a few days in the Mad River, it was time to move on. We were really banking on some sunset views over Lake Champlain, much like that one pictured in my last post. We headed up to Burlington for phase 2 of vacation. Since it was rainy, I insisted we stay someplace with a jacuzzi. And a fireplace. It was damned expensive but so very worth it. Especially after we got to Burlington, reconnected with television and news media to learn that tropical storm Nicole was going to rain on our parade for the remainder of our time in Vermont. We did get some adventuring in but it wasn’t until we were on our way home that I finally got a few glimpses of blue sky suitable for photography that doesn’t require complex math to determine exposure settings (despite the calculations, I was able to get a few awesome shots during the ‘fall color’ part of the trip). After a fitful night of waiting for the a-ok text message, we packed up our things on Friday late-morning and prepared for the long haul back to Michigan. In the rain. First, though I dragged Chris in to his second yarn shop of the trip. Then we headed west. Took a car ferry across the lake and decided to do the scenic route via Lake Placid. It was sorely tempting to stop here because it finally stopped raining but was too dark to see the lake(s). Unfortunately, 12 hours of driving plus stops on Saturday to get us home that night was just not feasible. Instead, we pushed on through to make it to the outskirts of Rochester, NY where we overpaid for a hotel room to sleep in for 6 hours. That left us with 7 hours of drive time on Saturday. We crossed in to Canada at Saint Catherine’s to avoid the traffic at Buffalo. Not to worry though, the back-ups were all for getting in to the US. The border crossing at Port Huron/Sarnia was a bit slow but she only asked us two questions: citizenship and did we buy anything? I don’t totally get the citizenship thing since I used a passport from the United States of America as my ID and we didn’t buy anything of substance during either Canadian portion. There was a bag full of McMinis on the seat between us but I decided that didn’t count (McMini defined coming soon). 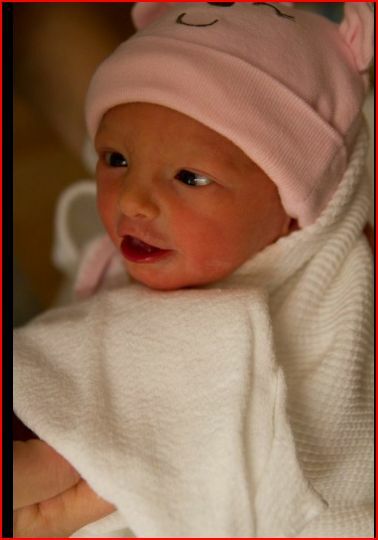 *Official time of birth was just shy of 1 AM. Little brother says he asked if they could wait until 1:10 AM so he could have a binary baby. I wonder if 1:01 would have worked too? A long awaited, do what we want vacation. Begins NOW. We are headed to Vermont but will be stopping on Montreal first. I’ve driven through Montreal but never stayed there. I think we will stay one or two nights then head towards Waitsfield, VT (site of our honeymoon). From there? There has been talk of going to Portland or even up to Bar Harbor. I’d love to spend a couple of days going along the coast of Maine but we have to be back in Michigan on 10/2 so that will probably be another trip. I have found it nearly impossible to describe the beauty, violence and 0ld-world feel of the Atlantic coastline as you approach the Downeast tip of Maine. Forget New Zealand, those hobbits really lived in the Bay of Fundy. I definitely want to take Chris there sometime soon. Our plans include: eating cheese, wine, pictures of fall color and probably a yarn shop stop or two. We hope to dine at the Green Cup Cafe again although the chances of lobster risotto on the menu again are probably slim. There should also be some jacuzzi time, a few drinks on the docks in Burlington overlooking Lake Champlain (see above) and maybe even a cooking class- about Vermont cheese! Since we are leaving in the evening, our intention is to get to Toronto tonight and get up early enough Saturday to be in Montreal for a late lunch. Toronto is a great city in itself but being “so close” will have to wait for another trip. Now that Chris has his enhanced ID, it won’t be such a big deal to skip over to Windsor periodically either. I am so looking forward to this time for some much-needed relaxing. When we get back, there is a visit from family, the last two weeks of school (really done, not a break but a graduation!! ), more family including a planned Halloween-type party to keep us busy until the snow flies. I’ll probably be ready for another vacation about then! 2. Saute onions and garlic in olive oil until onions are golden yellow. 3. Add kale to onions. Season with salt and pepper. Cook until kale is softened but still has a bit of crunch in the stems. 4. Drain potatoes. Add butter and sour cream then mash. Add more sour cream if they seem a little dry. 5. 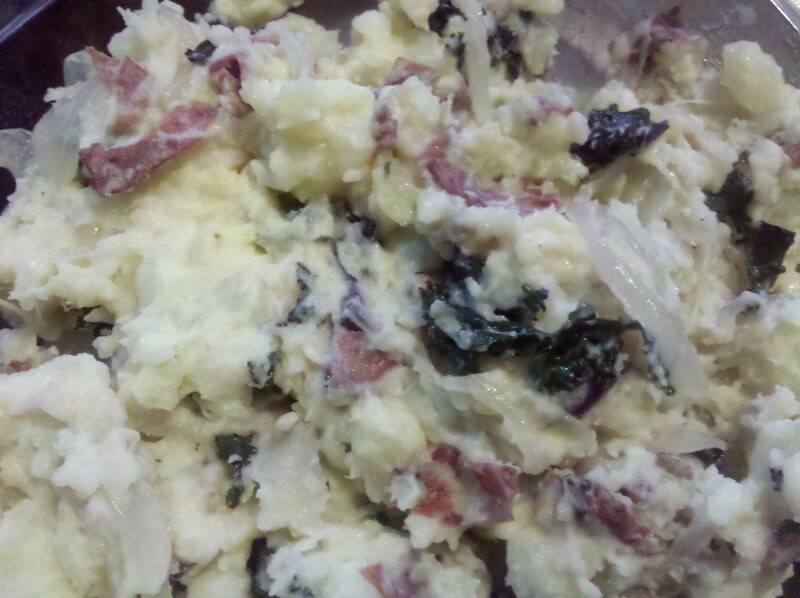 Combine kale & onion with potatoes. Season to taste and consider a garnish of sliced scallions and/or balsamic vinegar drizzle. Note: You may need to box up leftovers right away, unless you plan on eating this all in one night. Or banish yourself from the kitchen for the night. Sorry, honey, I can’t help you with those dishes! Chris and I enjoyed a lovely riverside dinner at Riverhouse Inn in Williamston on the last weekend in August. 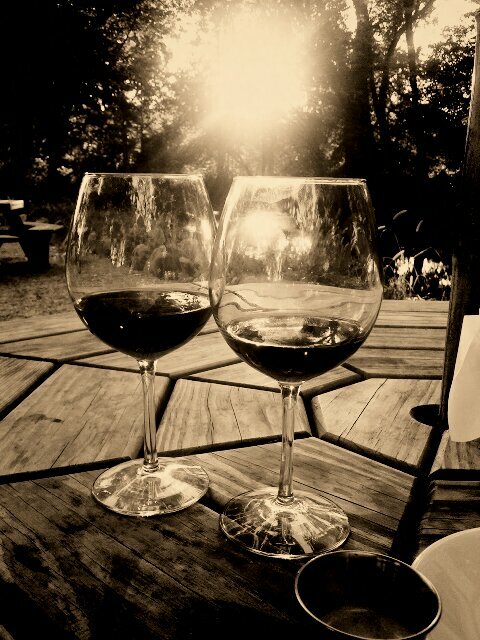 Hopefully we’ll have another chance for such a nice meal al fresco before fall truly sets in. I started two new classes today and unlike previous quarters, I haven’t done any reading yet. My first bit of home work is due Thursday, in both classes, we’ve been out of town since last Thursday, my google reader is overflwoing and ditto for my inbox, our fridge is both empty or full of ‘stuff’, depending on how you look at it and this weekend is our first wedding anniversary (!!) so I’m probably gonna have to pull out some kind of romantic meal at some point (we are going to an old favorite w/ special meaning for the official celebration). This post is mostly pictures. 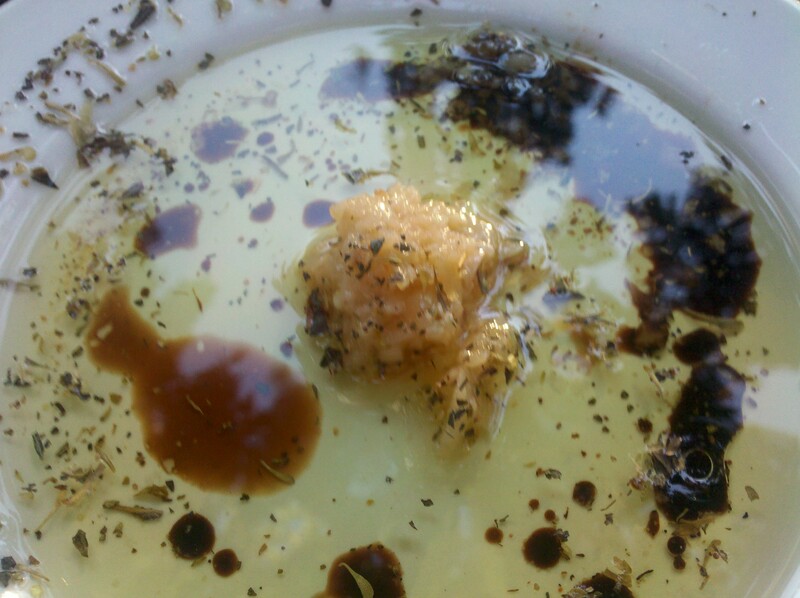 Bread is served with flavored olive oil. Yes, that is a giant mound of garlic in the center. You can use as much or as little as you like. We used most of it. 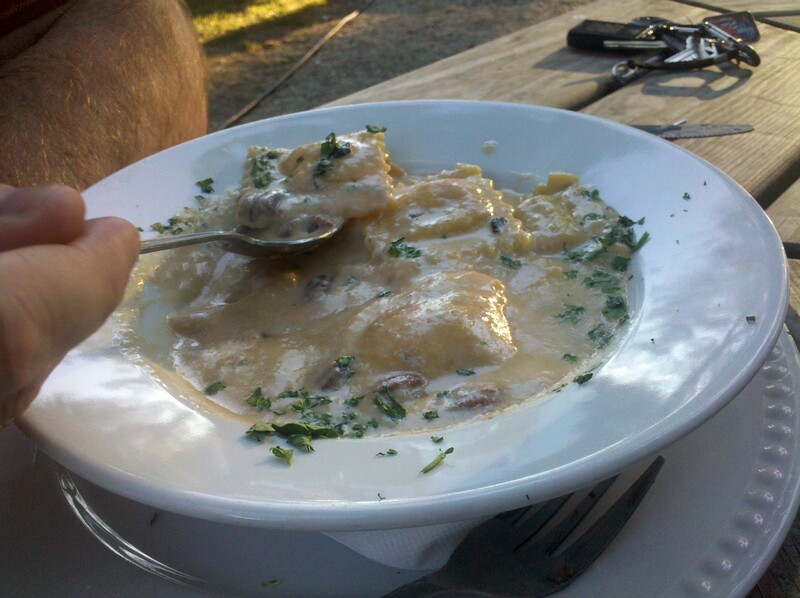 Chris had the butternut squash ravioli with a sweet, maple cream sauce and pecans. It was yummy and as you can see, I had to get my pics quick before he started chowing down. 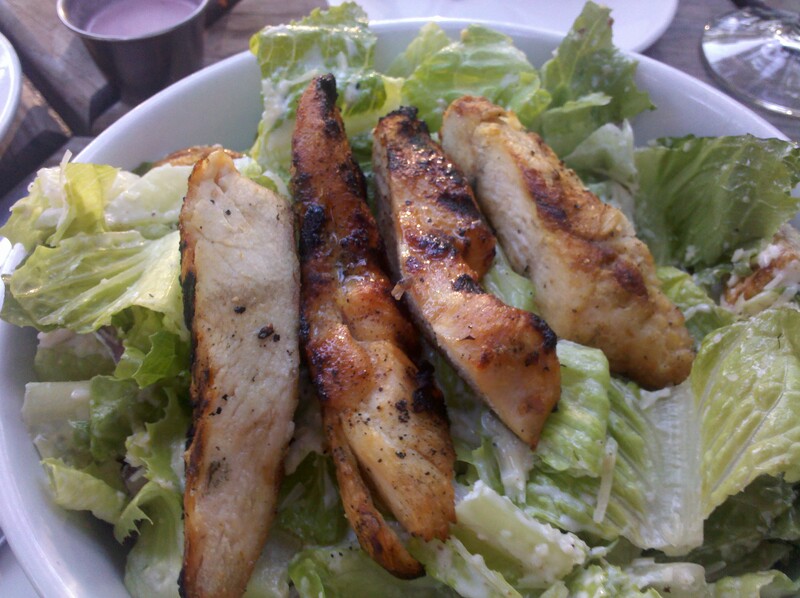 I had a hard time choosing but a craving for ‘green’ and crunchy’ led me to the Caesar salad with added chicken. The salad includes anchovies but whole ones so I just set those off to the side. Chris’s dinner came with a side salad and he decided to get two dressings, one for me to try (he’d sampled on a previous visit) and one new one. 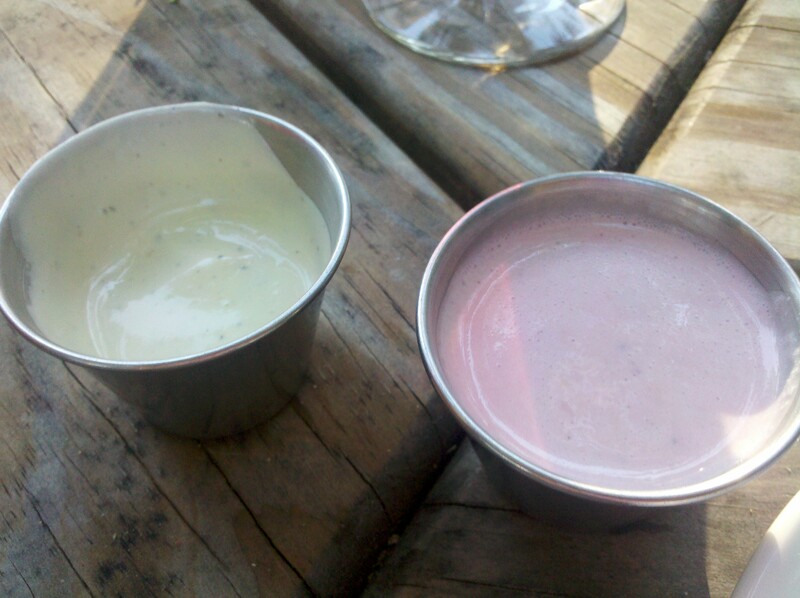 On your left is the avocado ranch and the right is raspberry vinaigrette, both house-made. I like green in all things (see above and my closet) but also the raspberry was bit sweet for my tastes. We actually had this first but I saved it for last because it was the best part of the meal. 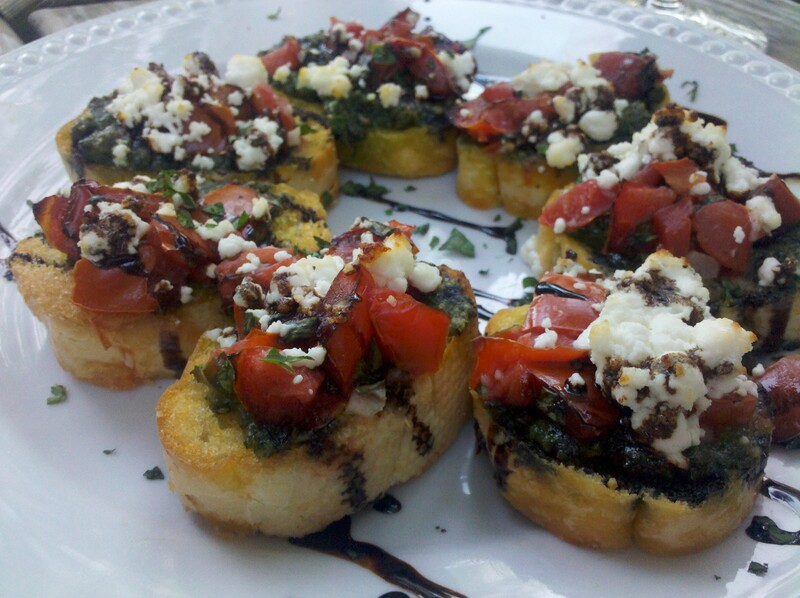 Two bruschetta options are offered, one with hummus, the other more traditional. Chris dislikes hummus (sigh) so we ordered this one. It was delicious though so I will forgive him. Menus available at the above website though not identical to the ones we had. Chris says they also make a good steak as went there for lunch while I was out of town a few weeks ago. There are three dining options- indoors, outdoors on the patio, outdoors at picnic tables down by the river. We ‘chose’ option 3 as it was nice out but all the patio seating was reserved. There is also a lovely gazebo for private dining. When we first came in, someone thought we were the party that reserved this gazebo which could have been very awkward later (there was a gift on the table). I may have suggested to Chris that he should take a cue from this when planning our dinner on Sept 11.